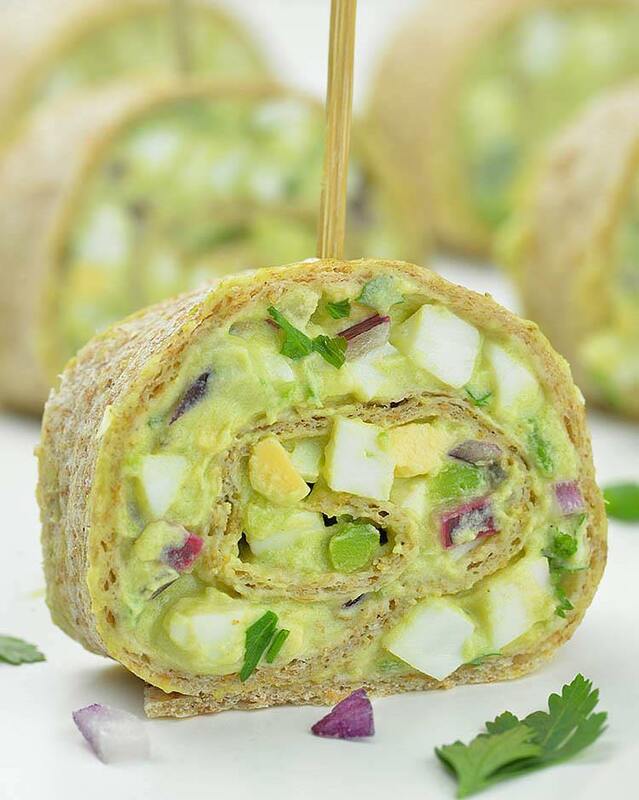 HEALTHY NO MAYO Avocado Egg Salad Roll Ups is perfect way to use leftovers of hard-boiled Easter Eggs. This simple recipe with only a few ingredients make perfect go-to lunch or snack, party food to feeding a crowd or just delicious way to get your morning protein in. Easter has passed and now we get from hunting eggs to eating them. Probably many of you have a basket full of dyed Easter eggs and don’t know what to do with them. This simple Avocado Egg Salad Roll Ups is perfect idea how to use leftovers of Easter hard-boiled eggs. 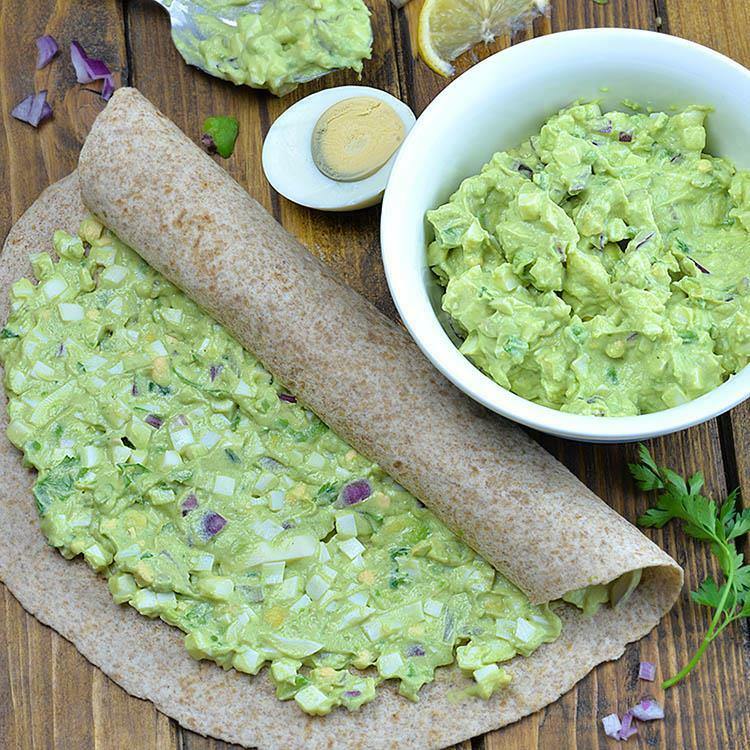 But not just after Easter, these avocado egg salad filled tortillas are perfect crowd pleaser appetizers for summer picnics and parties. You are probably used to eat egg salad sandwiches, but this is an interesting twist on classic. Caught with a bunch of Easter egg leftovers I was looking fun and delicious way to get rid of them. That’s how these yummy roll ups were born. I found Inspiration in my Skinny Chicken Avocado Salad Roll Ups. I love those tortilla roll ups and I wanted to try a different kind of filling. Avocado Egg Salad Roll Ups is awesome after Eater recipe for so many reasons. First of all you’ll get rid of egg leftovers. Then, this is super easy recipe. After baking and cooking all those fancy dishes for your Eater table, I’m sure you all want to make just simple and easy meals for a next few days. And finally, after eating a bunch of food for holiday, we need to reduce the calories. Speaking about reducing calories I made a healthy twist on classic egg salad. I use plain Greek yogurt and mashed avocado instead of the mayonnaise. Greek yogurt and avocado make this egg salad lighter and healthier than classic one made with mayo. But don’t worry it’s equally delicious. In order to keep this recipe skinny as much as possible, I used whole wheat flour tortilla, but you can use whatever you like the best. Hard-boiled eggs, avocado and Greek yogurt is basic elements for this recipe. As add-ins I used chopped red onion, green onion and fresh parsley, but you can tweak it to your own taste by changing the side ingredients. If you have a plenty of Easter egg leftovers, try this super simple, easy and HEALTHY NO MAYO Avocado Egg Salad Roll Ups recipe. 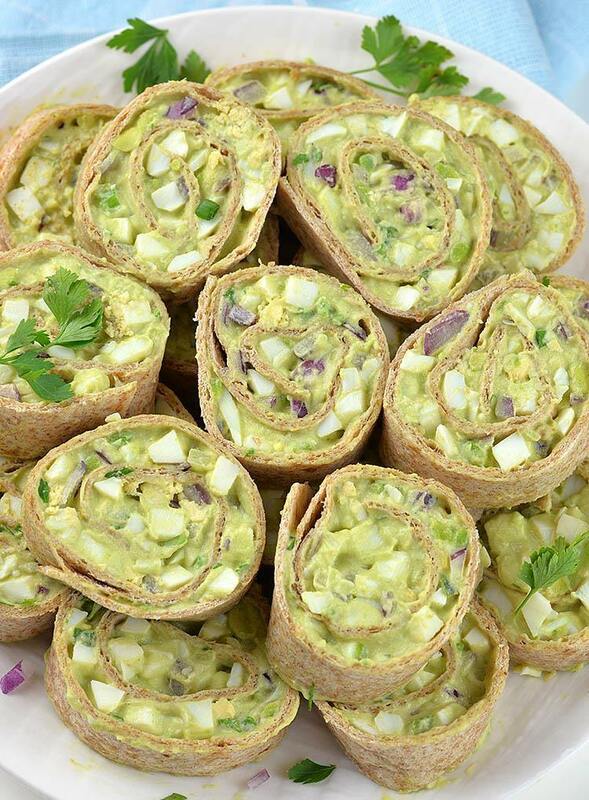 HEALTHY Avocado Egg Salad Roll Ups is simple recipe with only a few ingredients. This is perfect crowd pleaser appetizers for summer picnics and parties. 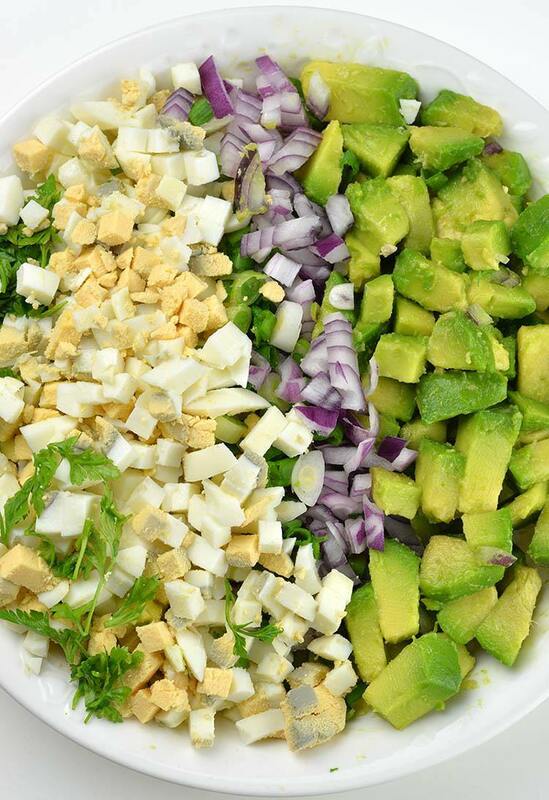 In a large bowl combine all ingredients (except tortillas) and stir with a wooden spoon until evenly blended. Spread the mixture over tortilla and roll up tightly. Repeat with remaining salad. I had enough filling for 3 10 inch diameter tortillas. Slice with serrated knife into ½- 3/4 inch slices. You can slice them immediately or refrigerate until firm (about 30 mins). It’s easier to slice when chilled. Store in the fridge in an airtight container until ready to serve. Regarding: egg salad and avocado rollups for Easter….”forget – about-it.” …. It is almost spring and my friend comes every Thursday after work for wine and appetizers. This is THE perfect appetizer for pre-spring. I am always looking for different and surprise appetizers and this its it. Thank you soooooo much.